Off topic, but I'm sad to note the passing of Biker Bard. My condolences to his family and many friends. Biker Bard - a man of infinite jest and discriminating thought. He shall be missed. I have a county in mind in North Carolina for you(JW) on election day. 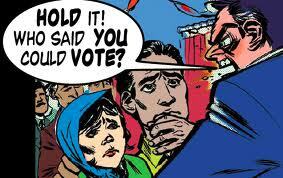 If you believe there is no voter fraud, I challenge you to spend six weeks in that county before the election day. Work both sides of the ticket. If after that experience, you maintain no voter fraud, I will consider your points. You have to see it first hand. Are you game or just political BS? No write until you experience it.